Did you know Tim Curry hates to discuss the Rocky Horror Picture Show? Apparently he was afraid he’d be typecast. He mostly refused to discuss it for years, even neglecting to appear in the Glee homage alongside other original film cast members. It’s a shame, because the movie is great fun, and Time Warp in particular is such an excellent tune. If you’re ever looking for a way to entertain yourself on a Friday or Saturday night, find yourself a Rocky Horror Picture Show screening nearby and take in the wackiness. In fact, it’s the most well-known and perhaps first cult classic midnight film. Time Walk effects have a long history in Magic, all the way back to the eponymous card in Alpha. Wizards has since realized that two mana isn’t a fair cost for taking extra turns, but even at a much greater rate, people are still interested. Every few sets a Time Walk effect shows up with some twist that typically involves one of the set’s mechanics. They’re often (although not always) not good enough for Standard, though there’s an ever-present contingent in other formats that pay more attention. At the very least, there is no shortage of EDH decks that enjoy jamming as many extra turn effects into their ninety-nine as they can manage, much to the chagrin of everyone forced to endure their company. Let’s take a look at all the cards with the text “extra turn” on them in Modern. Before we get much further, I want to look at how many times each one has been printed…oh, that was quick. Out of all of those, only three cards were printed more than once – Time Stretch, Time Warp, and Emrakul. All the rest have only a single printing to their name. This is especially impressive considering how old some of these are. Two of them are from Mirrodin, the first Modern block. This gives us our first monetary incentive: Wizards apparently does not like reprinting these. Even the ones that were reprinted were done so quite awhile ago. Time Stretch is from Odyssey and 10th edition, and the last time Time Warp was printed was nearly six years ago. Given WotC’s reluctance to reprint these types of cards, especially in recent years, extra turn effects appear quite safe from an investment standpoint. Reprints are the most dangerous aspect of holding onto cards for longer periods of time, and these seem relatively insulated from that threat. Emrakul as the runaway most expensive card isn’t too surprising. There’s a lot more to that card than the extra turn clause though, so we’re mostly counting him out from our examination today. Time Warp in second place doesn’t surprise me much either, as it’s clean, reasonably costed, and has actually been competitive or at least semi-competitive in Standard and Modern in the past. I am a bit surprised by the third-most expensive card being Lighthouse Chronologist. I assume this is based heavily on EDH. It’s easy to generate a pile of mana in that format, which means you can resolve and crank him to level seven in a single turn. If there aren’t any counterspells or spot removal available at the moment, you get to start taking turns at a 4:1 ratio compared to everyone else. Down towards the bottom are cards that are new, terrible, difficult to use, or some combination thereof. Wanderwine Prophets requires a great deal to go right, and also prices you into Merfolk, a tribe without much casual appeal. 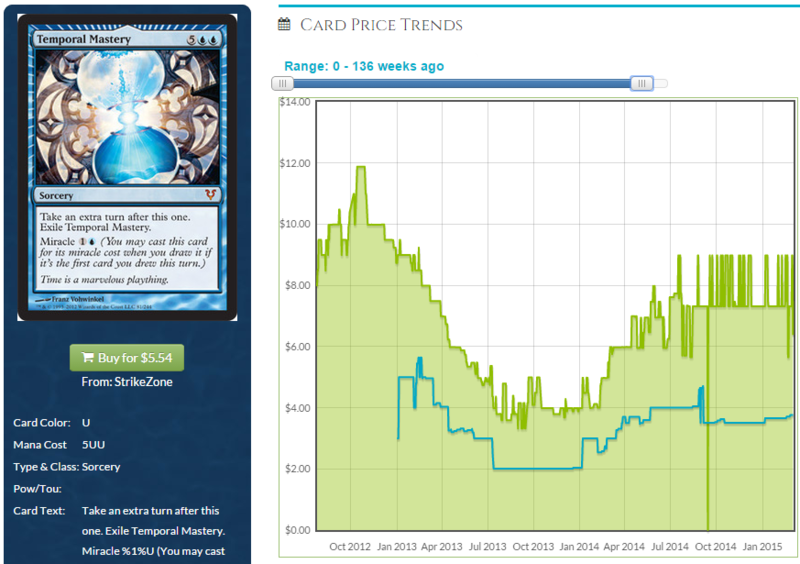 Ugin’s Nexus, Temporal Trespass, and Sage of Hours are brand new, and are still too liquid in the market to see price increases yet. We’ll come back to the latter two later. Search the City is also very new, but also very bad, and perhaps most importantly, actually impossible to use in EDH. Timesifter is the real reason Sensei’s Divining Top is banned. We all know that if Top were legal Timesifter would be ruining the format. Just kidding, the card is nigh-unplayable since you can end up giving free turns to your opponents if you aren’t in control of the top card of both libraries, or at are at least capable of floating high spells to the top of yours each turn. It is a curious spec target though, if you’re the real gambling type. I don’t know what the world looks like where this card is actually good in Modern or Legacy, but if someone Summer Blooms it, it would jump 100-fold. Notorious Throng, like Wanderwine Prophets, is complicated, difficult to activate, and forces you into a tribe that cultivates no enthusiasm. Magosi is currently unplayable, as it requires you to skip your turn to utilize it. There is almost potential – give your opponent an extra turn, but then begin proliferating the eon counter so you can take infinite turns – except that it requires you to return the land to your hand. A trick may exist to generate infinite turns with multiple Magosis, proliferate, and moving counters, but that’s going to be much too convoluted for anyone but the most die-hard kitchen table combo players to be too interested. Medomai is cheap and brand new, but is better than all of the other sub-$1 effects. You don’t have to jump through too many hoops for an extra turn, and there’s ways to cheat around his restriction by bouncing him each turn and using some effect to put him into play tapped and attacking. He’s from Theros, a widely opened set, although he’s a mythic, which is what we want to see if we’re buying in. I wouldn’t feel bad about taking this guy as a throw-in, as the upside could be considerable some time later. Time Sieve is a potentially powerful card, although it hasn’t found a home in Modern yet. That’s likely because any deck that can sacrifice and recur artifacts doesn’t need Time Sieve for help. Once that chain begins, you can just kill people with Emrakul or Bitter Ordeal or what have you. It also doesn’t seem to have struck a chord with casual players. Newer or casual players don’t tend to view sacrificing as a benefit, so Sieve may scare them off with what appears to be a huge cost. Temporal Extortion isn’t really a Time Walk per se, as you aren’t guaranteed the extra turn. It still carries a $3 price tag, mostly due to some players highly overrating punisher mechanics. Overall it’s not in the vein of what we’re interested in today. Stitch in Time suffers from the same problem that Temporal Extortion does, in that it doesn’t guarantee you extra turns even if it resolves. The coin flip aspect of the card draws some players in, but it’s not a “true” extra turn effect in the way that most other cards on this list are. Savor the Moment is more on our radar than most of these other inexpensive effects. At three mana it’s the cheapest Time Walk short of Time Walk. It comes with an obvious and fairly large drawback of not being unable to untap at the start of your turn, effectively rendering it a pricey Explore. If there’s a way to ignore the lack of an untap step this could eventually become a combo piece in Modern or Legacy though. I don’t know what that card or cards looks like, but it is conceivable such a thing could come to be. While Ral Zarek may say “extra turn,” that isn’t the main draw of the card. His Planeswalkeryness counts much more for any price tag than the extra turn aspect of his ultimate. 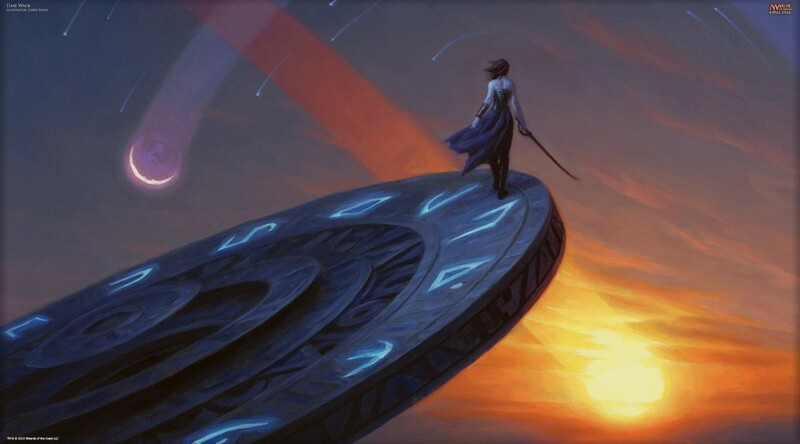 Temporal Mastery, Beacon of Tomorrows, Time Stretch, and Walk the Aeons are what got me thinking about this discussion. Temporal Mastery bottomed out about a year and a half ago below $4, and has since started climbing. A spread of roughly 30% isn’t remarkable, but it isn’t shameful either. With today’s price tag of Time Warp, I’m holding out hope for this one in the long term. It doesn’t see much competitive play at the moment, but remember that it did in fact win a Pro Tour. A single good Brainstorm-esque effect that let you put cards from your hand back on top of your library could quickly catapult this to Modern fame. It also floats around the fringes of Legacy playability becase of Sensei’s Divining Top, the most potent Miracle-enabler in existence. The Miracles deck hasn’t been interested so far because the deck isn’t poised to really take advantage of extra turns, but I don’t doubt that eventually some deck will be, and Temporal Mastery will catch in a big way. Beacon of Tomorrows has had a slow, sustainable growth for some time now. Three years ago it was a little over $2, and today it’s over seven, with a spread of about 30%. This type of growth isn’t awe-inspiring, but it’s consistent, and it’s consistent on a card with little appeal outside of EDH. Beacon isn’t competitive in any real format, and casual players are likely to be drawn towards cheaper effects such as Time Warp. 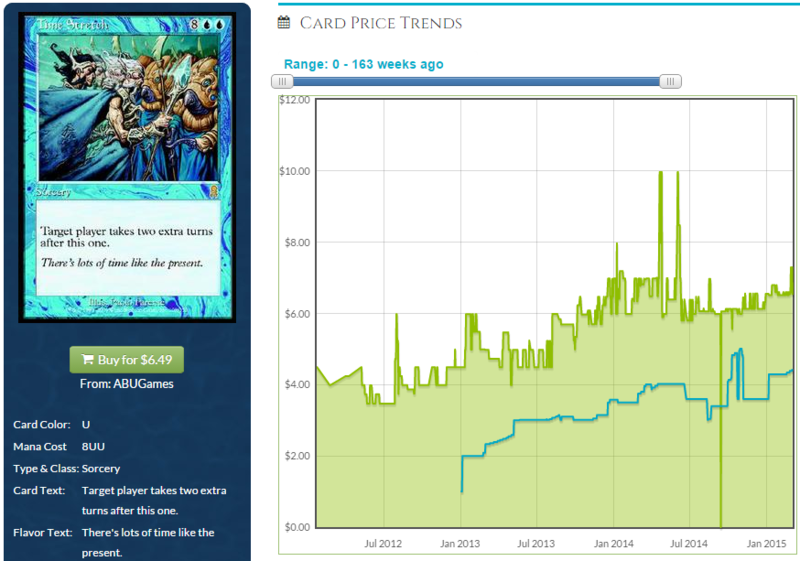 This tells us the card is growing (slowly) with a fairly low demand profile. This doesn’t inspire us to buy into Beacon, but it does tell us that you don’t need much demand for these types of effects to grow. Odyssey Time Stretch has grown about 60% since 2012, with a current price tag of $6.50. The 10th edition copy is in roughly the same boat at $7.50. Both also have spreads similar to Temporal Mastery and Beacon of Tomorrows. Time Stretch is the most savage Time Walk in EDH, with two turns stapled onto one card. This makes any sort of recursion with the card much more potent, whether you’re doing something mundane like returning it with Eternal Witness, or something that will get you kicked out of EDH circles, like copying it with Riku. (And then copying an Eternal Witness, getting back the Time Stretch and something that bounces the Eternal Witness.) The card hasn’t seen any major spikes, and like Beacon the growth has been slow, but like Beacon it’s also been consistent. We’re seeing a trend here – straightforward extra turn sorceries seem to land at at least $6. Walk the Aeons is an example of what happens when a Time Walk effect that looks like crap ends up finding a home. (In this case, it’s in Modern Turbo Fog lists.) When you can play four lands a turn, you’re drawing four or five cards a turn, and you’re constantly shuffling your graveyard into your library, the “sac three lands” clause doesn’t feel too bad. What we’re seeing here is a card with a very small demand profile outside of Modern jumping four to sevenfold. Most EDH and casual decks that want extra turns aren’t equipped to deal with the constraints of this card, making it purely a combo piece at this point. This is worth noting for Savor the Moment. It’s an extra turn effect that doesn’t seem that good on the surface, but a deck that can make it worth will at least triple the price. Let’s get back to those other two that I only mentioned briefly earlier – Temporal Trespass and Sage of Hours. Temporal Trespass falls somewhere between Walk the Aeons and Magosi the Waterveil. With a potential cost of UUU it can theoretically be cheaper than basically any non-power Time Walk. However, the fact that it exiles itself makes it very difficult to break this in combo decks. You’re likely only ever getting one turn off each copy of this card, and multiple copies are going to be very difficult to cast. Overall, the outlook for Trespass is quite poor. Sage of Hours, on the other hand, is something special. A full disclosure: I have copies stashed away, so I do stand to gain if it rises in value. Why do I like Sage? He shares form with Lighthouse Chronologist, which is second only to Time Warp itself. You undeniably have to put in some work to get a return – those counters aren’t showing up for free, and it’s going to cost more than whatever spare blue mana you have lying around to start taking extra turns. The flip side of that is that the payoff is potentially larger than anything else examined so far. Where Chronologist will get you turns at a 4:1 rate, Sage will just make infinite turns with Ajani, Mentor of Heroes and Doubling Season. Any novice EDH player will tell you that there is no shortage of other ways to accomplish this as well. Even if you aren’t shooting for infinite, he’s constantly threatening to give his controller at least one extra turn, and sometimes more than that. Perhaps the best part is his print run – he’s a mythic in an underwhelming small spring set that was overshadowed a month later by the release of Conspiracy. If your goal was to put as few copies of Sage of Hours into the market as possible, you couldn’t pick a better set. He should play reasonably well in kitchen table Magic, where everyone lives in Magical Christmas Land and removal tends to be sparse. EDH players should cozy up to him, at least the +1/+1 counter brigade. And finally he has an outside chance of being playable in Modern or Legacy combo of some sort. If that sounds ridiculous, just remember that Dark Depths used to be one dollar because everyone thought it was absolute garbage, and then they printed Vampire Hexmage. Aside from the Judge printing of Time Warp, no extra turn effect has appeared in the Modern border twice. All of the cards granting extra turns that are at least mildly playable have risen beyond bulk, and the ones that find homes in EDH, casual decks, or combo jump into the $6-$15 range. Overall, it seems Time Warps are reasonable pickups, with Sage of Hours being the spiciest of the bunch right now. I’d be surprised if this isn’t $5 within a year or so, and I don’t think $10 is out of the question. Meanwhile, Temporal Mastery is still appealing as a trade pickup, and I wouldn’t turn my nose up at Savor the Moments either. Most of these cards may not see the splashiest rises in prices, but they are rock solid in value, and not a single one has dropped in price. The next time you’re browsing someone’s binder looking for something to fill up a trade, consider taking a moment for yourself. I’m sorry to post this comment on this specific article, it actually refers to the “Another Million Billion Faeries, Please” article, following our discussion about MM2 reprints. Please forgive me if you’ve seen this comment there before! Hi Vince. The European market is absolutely different than the American one, although I can’t give you specific examples at the moment. 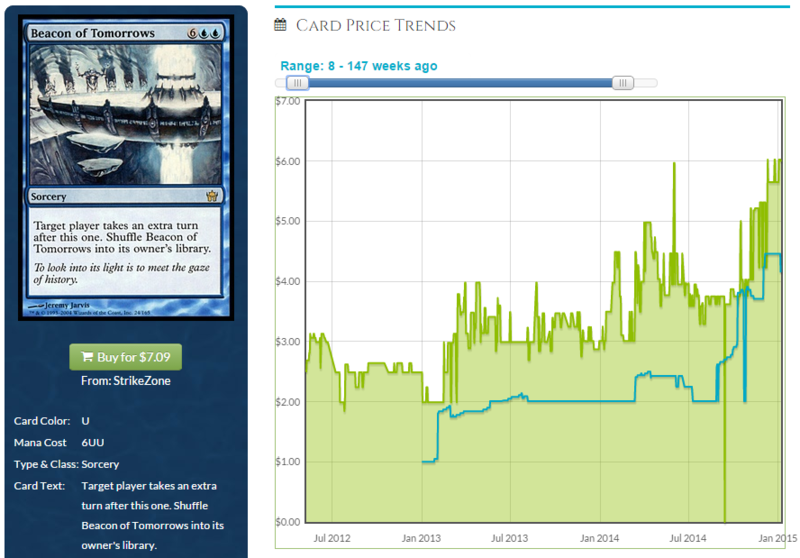 When I quoted $190 Tarmogoyfs, that was a retail price. 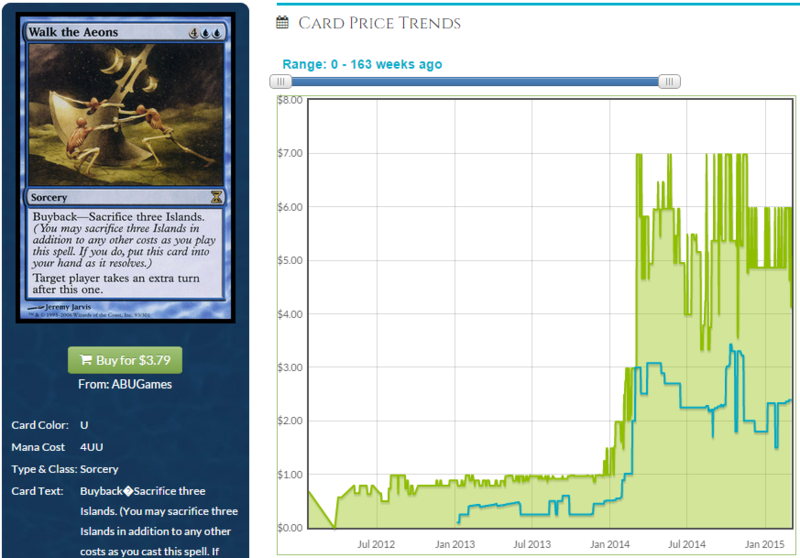 TCGPlayer, SCG, CFB, and most other American websites were selling Tarmogoyfs for this price or more. I’m aware that copies were available on eBay for a bit cheaper. MM2015 will be printed in English, Japanese, and simplified Chinese (http://magic.wizards.com/en/articles/archive/arcana/announcing-modern-masters-2015-edition-2014-12-08). I don’t see European-language Goyfs being much more resilient to price changes than EN or JP copies. Cards in French, Spanish, Italian, and sometimes even German tend to be just as much or less than EN copies. Russian is more popular, but for the most part, non-foils of any Euro language won’t weather a reprint any better. This goes for all cards. I’ll consider selling my goyfs and other possible Modern staples that can be the target of a MM2 reprint then! Good guess with the Goyf’s! MM2 reprint! Sadly I haven’t had the chance to drop these before. What do you think I should do? DO you think that it’ll take much time for Tarmogoyf to regain it’s current value? Let’s compare Magistrate’s Scepter to Sage of Hours. Magistrate’s Scepter is a hardy artifact while Sage of Hours is a squishy 1/1 creature. Sage becomes less squishy, however, as he builds up +1/+1 counters. Magistrate’s Scepter can be put in any deck while Sage requires blue mana. Magistrate’s Scepter is 3 mana while Sage is 2. Magistrate’s Scepter requires 12 mana and 4 taps to finally work. Sage requires 5 counters (being targeted or counter duped) to get going. Recurring casting cards like Shimmering Wings do exist. It’s easier to put +1/+1 counters on Sage than dedicated charge counters on the Scepter. Magistrate’s Scepter is a 4.40 card while Sage is a 2.00 card.